The London-bound travellers on the Friday morning train must have wondered what on earth was going on. There in their midst was a well-known chef, with an overnight backpack – and a large bunch of rhubarb. But this was no sinister attempt to introduce Southern softies to the joys of great Yorkshire rhubarb – it was James en route to the Saturday Kitchen studio. 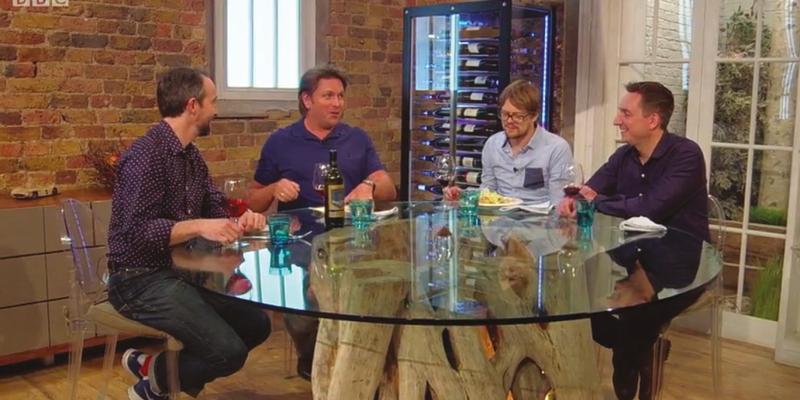 The rhubarb was a surprise gift for the show’s regular host, fellow tyke James Martin, a reminder of his roots. Aired at the end of January, the show’s other guest chef was pal Stephen Terry, from The Hardwick in Abergavenny. He and James worked together last year when they were part of a team of top-name chefs, including Tom Kerridge, Chris Mackey, Josh Eggleston, Dom Chapman and Ben Tish, who cooked a fundraising dinner at The Hardwick during the Abergavenny Food Festival.An old hand at Saturday Kitchen, Stephen had plenty of welcome advice for first-timer James – although his plan to go out and have a few drinks the previous evening was a bit less welcome, specially as the day starts at 6am with a full run-through of the show before live broadcast at 10am.The celebrity guest was the youthful Kris Marshall, best known as Nick in My Family, Adam in the long-running series of BT ads, and, more recently, as DI Humphrey Goodman in Death in Paradise.